Woodrum got in rhythm early, methodically moving the Flames down the field on a nearly seven minute drive that resulted in a field goal. For the second consecutive week, the Flames were able to take some serious time off the clock on their first possession and come away with points. Unfortunately that was the closest a Woodrum would ever get to the end zone. Woodrum missed out a couple opportunities to put six points on the board for the Flames, including a overthrowing a wide open Dante Shells downfield as he rolled to his left. 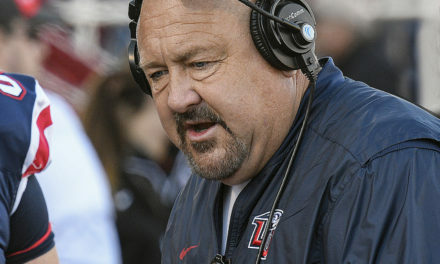 The second quarter was highlighted by a costly fumble deep in Flames territory when Woodrum failed to secure the ball on a sack. A second fumble as the Flames were driving in the fourth quarter proved to be the final nail in the coffin as the Flames were blown out at Southern Illinois. The inability to run the ball killed the Flames this week, rushing for an average of 2.2 yards per attempt against the Salukis. Todd Macon scored the lone Liberty touchdown, but that was the only bright spot in an abysmal running game. Peterson was a late scratch for the Flames, but the receivers performed admirably in his absence. LCA product B.J. Farrow had a breakout game, catching 8 passes for 101 yards. The passing attack looked dominant at the onset, but drops and poor pass protection limited the receivers productivity as the game progressed. This offensive line is going to be a major liability this year. They failed to generate any push when run blocking and on two occasions allowed a linebacker to hit Woodrum untouched. One of those hits resulted in a fumble that gave SIU the ball inside the Liberty 10. That possession turned into 7 points for the Salukis. Another similar sack resulted in the second fumble of the night, effectively ending any chance of a Liberty comeback in the fourth. The strength of this Liberty team was quiet on Saturday night, failing to record a single sack or quarterback hit. While the lack of stats could be explained by the short, quick passes that comprised a majority of the Saluki’s offense, ISU quarterback Mark Iannotti was able to consistently run up the middle when his receivers were covered. He ended the night with 56 yds on 9 carries. The Flames’ defense never found an answer for SIU’s fast-paced offense and got gashed for nearly 500 yards, 255 on the ground and 227 in the air. As the game wore on, the linebacking corps looked especially tired. The Flames couldn’t get the Salukis off the field, keeping the game out of reach in the second half. Like the rest of the defense, the defensive backs never figured out how to stop the speedy Saluki offense. Iannotti didn’t throw the ball downfield very often, but when he did he managed to complete passes over what seemed to be well-positioned Liberty defensive backs. 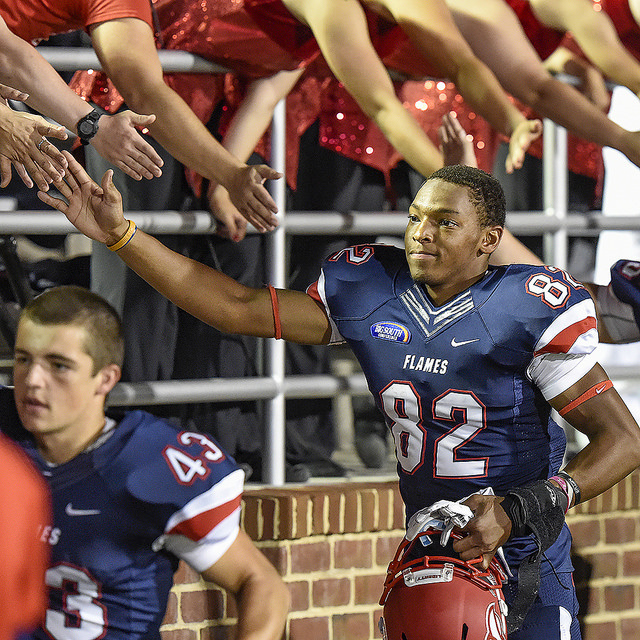 Alpha Jalloh came down with the lone interception in the 4th, giving the Flames a shot to reduce SIU’s lead to one score. After failing to take a kickoff past the 20 on the first three possessions, Damian King was able to take a return back 30 yards in the third. The John Lunsford of 2014 is long gone. Two more missed FGs in this one.